I just wanted to let you know that life is going to be so great for you! Right now you are in a a funk. You think that you have to have a boyfriend all of the time and that is just silly. I mean really—look at the guy you are dating now!! Good grief. Where on earth did you find HIM???? You can do so much better! And while I am on the subject of self esteem—YOU are wonderfully made. I know that you feel geeky now and really out of sorts with the rest of the world but once those braces come off, that front tooth gets fixed and your stringy hair gets some shape to it you are going to realize that you are a pretty great girl with a huge heart. Looks aren’t everything and not everyone is going to have superstar beauty. I think if you look around you will see that that is actually very rare. The real beauty comes from within and you have that. 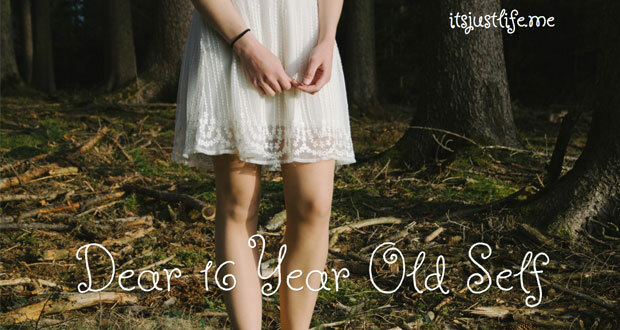 If you wrote a letter to your 16 year old self what would you say? It is a great exercise and I honestly would love to read what you would write. If you have a blog and do it on your blog please leave the link here in the comments so I can visit. Feel free to use the graphic above if you would like to use it in your post. I can send you one without my watermark. If you want to write and send it to me in an email I would cherish it as well. ([email protected]) I truly would love to read what you write. How did we survive adolescence? And how did our parents survive the drama? You’ve captured it well, my friend. Thank you so much Laura. It was a good exercise. I would love to see what YOU would write! Wow! The memories! I’m not quite sure how my parents survived either! Very sensitive and intuitive writing. Wouldn’t it be fascinating if we could have actually met our younger selves? I know! Yes! How did our parents survive and what on earth was I thinking then? I would love to see what you come up with if you write a similar post! Very well done, Beth Ann. When I wrote a similar post a while back, I sat and thought about all the sensible things I was sharing with my youthful self and if anything might have made a difference during that, sometimes painful, period of life. But, we did survive, in spite of it all. Sharing the link to my post; thank you! Oh yay! Glad to read your post. I actually did this a long time ago for the prompt that you might have done yours for and decided it was worth reposting. Thank YOU for sharing yours. Going there now! Great post! I think our 16 year old selves would be amazed at what we would tell them!! Yes–they would for sure. I know I never dreamed of the things that would happen for me and to me over the years. Can’t wait to read what you come up with. This is a powerful piece because you share hope and trust for the future. I needed to read that today and your post. Thank you. WOW! This is awesome! I’d love to do one, but it might require a bit of thinking!! You are an amazing woman with one of the biggest hearts and I’m so glad you’re a part of my life! HUGS! There are many lessons I have learned along the way that I wish I had learned sooner, but there’s just no way my 16 year old self would ever take anyone’s advice! Also, those pants are amazing! NI can’t believe you are the first one to comment on the picture!!!! Wasn’t I a gem??? ?thanks for stopping by! The girl in the photo was anything but…hideous. Beautiful then…as now! The pants…not so much. What about that old boyfriend? Do you ever wonder where his life took him? Maybe he has overcome whatever issues he had as well.. It might be fun to do a little (covert) investigating. There is a site that I believe is called Pipl where you can attempt to find people you know or knew. Anyway, your life has taken you on such a great number of journeys and missions that the 16 year old you could never have possibly imagined. You are so funny….I KNOW where that old boyfriend is and what he has become and while I am sure he is happy with his life I can not imagine life with him and not Mr. Diamond. But yes–life has taken on many adventures over the years! You have done well indeed. Going back to look at the pants…. This made me cry! So beautifully written. Aw. Thanks. I think this is my “voice”, don’t you? Very interesting! Great post, Beth Ann. This is one of your best blogs I think. All our four children kept us busy and they did not always agree with us but they all turned out to be pretty good adults. I wish someone would have written that letter to my 16-year-old self! That is such a hard age. It is a very difficult age and goodness knows I could have used this back then. Geeze! Nice bell-bottoms, Geek! [I think I can get away with this, being a brother… I’ve been guilty of even more hurtful comments, during our formative years, and I think you still love me (don’t you?)]. I’m trying to remember the boyfriend at 16. Busted knees? YES!!!!!!!!! Busted knees it was. Good grief. And yes—you can call me any names you like and I will always adore you. Hey–someone had a Jart set for sale in their Vintage shop. Want me to pick it up and see if your aim is any better at 55? Oh gosh—I really am tired! I mistyped your age. With my 55 looming in a few weeks I am getting anxious. I miss those days as well! How did I miss this post earlier???? This is great! Oh, how we could all have used such advice when we were 16? As Patti commented, that is a tough age. Glad you enjoyed the post—we all had quite a few things to deal with at that age, didn’t we? You’re such a beautiful woman now (inside & out), it seems hard to realize you thought you were gawky & awkward in your past. Aw–you are so sweet! Yes—I had a lot of insecurities but thank goodness I am at a different place in my life now and love who I am!